What lived in ancient human intestines? Jessica - What we can gain from studying the microbes that our ancestors had is to sort of compare it to what we have today and see what we're missing. So, we know that because of things like our widespread antibiotic use, intensive hygiene practices, and spending so much time indoors, and sort of our more high fat, high protein diet, that lack fibre, we've probably changed our gut microbiome substantially. And so, the question is, what did we use to have? How do we figure that out? One of the ways we can do that is by looking at the microbes that our ancestors had that's preserved in faecal material around the world. Faecal material is what we usually study to characterise a gut microbiome because when you poo, out comes all the microbes that are in your colon as well. And so, this gives us a really nice, easy way to understand what's in the gut. 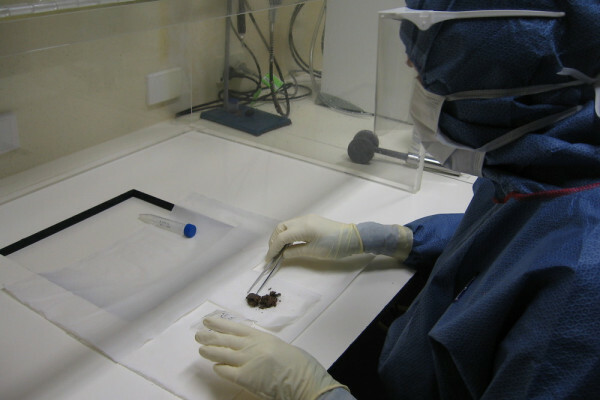 And so, we have been able to study faecal material from caves in North America and Central America, Viking latrines from England, and also occasionally, in naturally mummified human remains. Kat - So, when you get a sample like this, how do you go about studying it? What are you looking for and how do you treat it? Jessica - Because these faecal samples have been sitting around from anywhere from several hundred years, several thousands of years, we really worry about contamination. And so, we work with an ancient DNA lab - so, clean labs to help protect the samples from further environmental contamination and also, to allow us to really cleanly sort of remove the outer layer of these samples with like a Dremel drill and also with bleach, so that we just get the DNA out of the middle where it's most likely to have avoided contamination from soil or other environmental microbes. Kat - What have you found out so far from studying these samples, from studying the DNA in them about what's different between our gut bugs today and those of our ancestors that live before us? Jessica - We're finding some really, really interesting results. So, we're confirming our hypothesis that certainly, people living in western societies today are missing some microbes. And so overall, there's a lot lower diversity or number of microbes in our gut microbiomes. And so, we're finding that we're not only missing particular bacteria like a diversity of this whole group called treponema but also, different strains of bacteria that we do have, we just don't have as many different types anymore. Actually, one other really interesting finding is that it's not only the bacteria that we're missing but also, the microscopic eukaryotes. So, eukaryotes have nucleated cells like us, so eukaryotes, plants, fungi. But most eukaryotes are actually microscopic and we usually think of them as parasites. But some of these small microbe eukaryotes were probably beneficial or at least not harmful and we're almost completely missing those in western populations now. Kat - I was going to ask, obviously, having loads of bacteria and parasites could be a good or a bad thing and we do have this assumption today that our modern life is terrible and making us sick. Do you think this difference in our microbiome from how it used to be to how things are today? For someone like me, I live in the city. Is this actually doing me harm and is it contributing to the kinds of diseases that do seem to afflict us more as modern humans? Jessica - Well, I think the only honest answer to that is we don't really know. There are studies coming out that suggest that certainly, maybe some of the autoimmune diseases and sort of the effects on training our immune system by not having enough of these microbes may be a real phenomena. But this is incredibly complex and it's going to be really complicated to pick a part. But I think overall, we know that things like eating fibre increases the diversity of our microbes and that's most likely going to be a good thing. Previous Do gut bugs affect your brain? Next How many bacteria accompany a kiss?